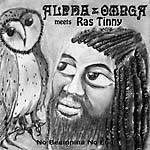 UK dub pioneers Alpha & Omega present their first new studio album since 2012. No Beginning No End is a nod to the classic A&O sound yet illustrates A&O's forward thinking and distinctive outlook on reggae music. Featuring the unique vocal stylings and astoundingly intelligent lyrics of Surinamese singer Ras Tinny. Another A&O classic, and well worth the wait.